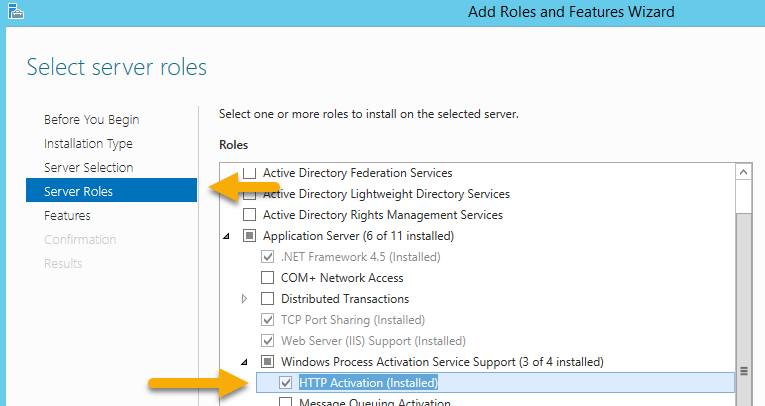 Does SharePoint 2013 require server role “Http Activation” enabled along with its feature role? I see "HTTP Activation" at both server role and under features as well. Is it needed to be enabled under server role as well. Please suggest. Hello here are described server roles and features which need to be activated for SharePoint 2013. There is Windows Feature AS-HTTP-Activation which must be activated, so I think, answer is YES. Otherwise there can be a little differences caused by version of Windows Server you run your SharePoint 2013 servers. Not the answer you're looking for? Browse other questions tagged 2013 sharepoint-server windows-server features roles or ask your own question. How to restore inheritance of just the role definitions (“permission levels”)?